On 23 June 1812 the French Grande Armée, over 600,000 strong and composed of men from the many nations that had become part of Napoleon’s empire, poured over the Russian border. In defense of Russia, an army of approximately the same number faced them. The campaign was disastrous for Napoleon, and it marked the beginning of his decline in power. Amongst those who participated in the campaign was von Clausewitz. This renowned Prussian military strategist and historian defected from the French Army and joined the Russian Imperial headquarters where he spent the campaign close to the senior Russian officers who made the critical decisions. 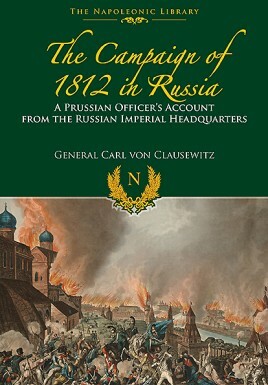 The campaign raised many questions which continue to be debated to this day and Clausewitz’s considered account has long been regarded as a highly valuable source. His expert analysis of the Battle of Borodino indicates that he was heavily involved in the engagement as a staff officer, whose duties would have entailed his constant traveling round the battlefield. He was present at the secret Convention of Tauroggen, and his account of this important treaty and its effect in bringing about the defection of the Prussian corps from the French is unique.